Hundreds of people have objected to plans for a modern bridge in a Cornish village where river floods caused millions of pounds worth of damage. The Environment Agency says Lower Bridge in Boscastle needs to be replaced as part of a flood defence scheme under way at the river Valency. A petition against plans for a new curved steel and granite bridge attracted 600 signatures in three days. A public meeting is being held on Wednesday to discuss the bridge plans. Residents say the proposed new bridge will spoil the character of the village. Work to help the river Valency cope with heavy rainfall is expected to take two years. The Environment Agency is widening and deepening the river, to increase its capacity when levels are high. The river burst its banks in August 2004. 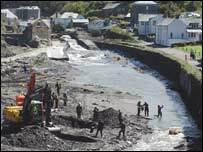 Homes were flooded and cars were swept away when about 440 million gallons of water swept through Boscastle.